Fees for signatures are controlled by the State of Texas. The maximum fee is $6.00 for an acknowledgment or jurat. Travel fees are in addition to notary fees. Our notary carries a current state mandated fee list and it is available upon request. Additional time spent for witnessing, ID verification and other tasks which are not direct notary transactions will incur hourly charges at a rate of $50.00 per hour billed in .25 hour increments. A minimum non-notary charge is $12.50 for 15 minutes and is in addition to any charges for travel and notary transactions. The rates shown on this site do not apply to Real Estate Closings. Real Estate closings require additional services which are outside of notary duties. Real Estate packages range from $100 – $150 + additional expenses for late scheduling. Call for information. We understand that things come up. We’ll help if possible but understand additional fees may apply. Trips to detention centers or jails are $100 minimum. Travel fees are determined by where I have to go to meet a client and the number and type of non-notarized documents such as witnessed documents. 14 minutes of wait time is included in these rates. These rates can also be used to determine rates for other services based on a scheduled turnaround. Rush fees may apply. The following form provides a few zip codes and hospitals. If a zip isn’t listed, or if you have additional requirements such as pickup and delivery to more than one location on the same trip, please call for an estimate. We now have a minimum 1 hour charge of $50 with additional time charged in .25 per hour increments. Travel fee does not include notary fees. Notary fees are charged based on allowable charges allowed by Texas. General rule is $6.00 per signature. Rates are based on round trip travel and include mileage. Additional fees as allowed by the state for notary signatures is in addition to the stated travel fees and will be applied. 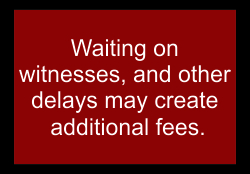 Additional charges may also apply for time waiting on site or for witnessing documents. Travel fee does not include notary fees. Notary fees are charged based on allowable charges allowed by Texas. General rule is $6.00 per signature. Travel fees may be based on location. Some hospitals don't have easy access or parking so an additional .25 hour is added. Do you know the number of notary signatures required? You can schedule a future appointment online. It must be more than a week out. We will confirm the appointment using your chosen contact method. If you need an earlier appointment, please call (469) 626-8436 to determine availability. Example: 3/12/2018 We will contact you to confirm your appointment using your preferred method of communication. Flexible9:00 a.m. - 10:00 a.m.10:00 a.m. - 11:00 a.m.11:00 a.m. - NoonNoon - 1:00 p.m.1:00 p.m. - 2:00 p.m.2:00 p.m. - 3:00 p.m.3:00 p.m. - 4:00 p.m.4:00 p.m. - 5:00 p.m. Please provide the address where the signing will occur. Travel charges are based on this location. This is the method we will use to contact you. If we are unable to get a response, we will use the next method. If we are unable to contact you after 2 days, we will disregard the request.